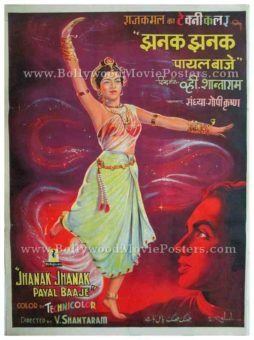 Old Bollywood movie poster of the super hit V. Shantaram Hindi film, Jhanak Jhanak Payal Baaje (1955) for sale. This is an actual surviving original vintage Bollywood poster of the 1955 hit Hindi film that starred Gopi Krishna and Sandhya in lead roles. Directed by one of the most influential filmmakers in Indian cinema, V. Shantaram, Jhanak Jhanak Payal Baaje was one of the early Technicolor films made in India. Jhanak Jhanak Payal Baaje was declared a super hit and won the Filmfare Best Movie Award, making this very rare hand painted Bollywood poster, highly collectible! It is widely believed that the Indian classical musical instrument, Santoor was used for the first time in Indian cinema in the film Jhanak Jhanak Payal Baaje, further increasing its collectible quotient! This beautifully designed Bollywood movie poster was originally hand painted on canvas by one of the most sought after Bollywood poster painters of his time, DR Bhosle. This poster is a slight deviation from DR Bhosle’s minimalist approach to Bollywood movie poster design. Lead actress Sandhya is seen dancing in a beautiful hand painted avatar prominently on the poster, amidst a very vibrant and colorful background. A smaller side profile portrait of Gopi Krishna appears in red at the bottom. The printed signature of master Bollywood poster painter DR Bhosle is seen on the bottom right hand corner of this old Bollywood poster. Capitalizing on the fact that the film was released in an era when Technicolor technology was in a very nascent stage in Indian cinema, the poster bears the words, “Color by Technicolor” in a multicolor font at the bottom. 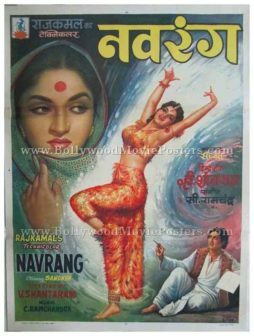 Old Bollywood movie poster of the hit V. Shantaram Hindi film, Navrang (1959) for sale. 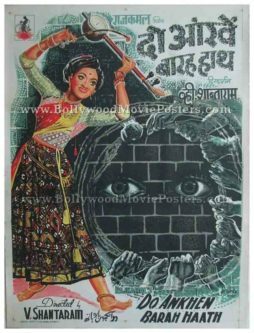 This is an actual surviving original vintage Bollywood poster of the 1959 hit Hindi film that starred Mahipal and Sandhya in lead roles. Written and directed by one of the most influential filmmakers in Indian cinema, V. Shantaram, Navrang featured fabulous dance performances from lead actress Sandhya. Navrang also marked the signing debut of noted playback singer Mahendra Kapoor, who sang the hit song “Aadha Hai Chandrama Raat Aadhi” in the film. The film bagged two Filmfare awards, making this very rare hand painted Bollywood poster, highly collectible! This beautifully designed Bollywood movie poster was originally hand painted on canvas by noted Bollywood poster painter, S. Vilas. A fabulous hand painted portrait of lead actress Sandhya in a glamorous dancing pose is seen prominently on the poster. 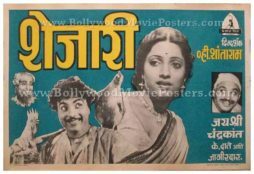 The printed signature of Bollywood poster artist S. Vilas is seen on the right hand corner of this old Bollywood poster. Old Marathi movie poster of the hit V. Shantaram Hindi film, Chandanachi Choli Ang Ang Jali (1975) for sale. This is an actual surviving original old movie poster of the 1975 hit Marathi film that starred Ranjana Deshmukh. 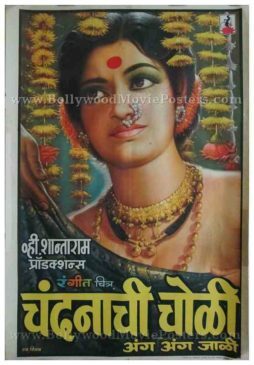 Produced by one of the most influential filmmakers in Indian cinema, V. Shantaram, Chandanachi Choli Ang Ang Jali marked the debut of Ranjana Deshmukh into the Marathi film industry, making this poster, highly collectible. Printed and circulated during the original first release of the film (early 1970s), this old hand painted Marathi movie poster was originally designed for publicity of the film but never ended up being used. This beautifully hand painted old Marathi movie poster features the lead actress in her full splendor holding on to her saree while a hand appears on the top attempting to remove it. Flowers are seen hanging from the ceiling in the background of this old Marathi movie poster. 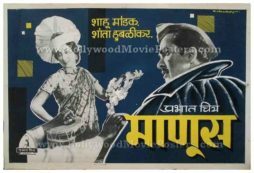 Extremely rare, old Marathi movie poster of the black and white film, Manoos (1939) for sale. This is an actual surviving original old Marathi movie poster of the 1939 film which was produced by Prabhat Film Company and directed by legendary filmmaker, V. Shantaram. Manoos is widely regarded as one of the best classics ever made by V. Shantaram and is ranked as one of the best social films ever made in Indian cinema. The film was seen and praised by Charlie Chaplin himself, making this old Marathi movie poster, highly collectible. Printed and circulated a few years after the first release of the film (early 1940s), this old Marathi movie poster was originally designed for publicity of the film but never ended up being used. Prabhat Film Company popularly known as Prabhat Films is widely regarded as one of the finest film production companies and film studios in the history of Indian cinema. It was established in 1929 (towards the end of the silent films era) by noted film director V. Shantaram, in Kolhapur, Maharashtra. The company moved to Pune in 1933, where it established its own studio and produced a total of 45 films in both Marathi and Hindi over a period of 27 years. Prabhat Film Company created a name for itself owing largely to its production excellence and social awareness themes. Extremely rare, old Marathi movie poster of the black and white film, Shejari (1941) for sale. This is an actual surviving original old Marathi movie poster of the 1941 film which was produced by Prabhat Film Company and directed by legendary filmmaker, V. Shantaram. Shejari was one of the first Marathi films to create slow motion sequences using specialized camera equipment, making this old Marathi movie poster, highly collectible. Extremely rare, old Marathi movie poster of the black and white film, Dharmatma (1935) for sale. This is an actual surviving original old Marathi movie poster of the 1935 film which was produced by Prabhat Film Company and directed by legendary filmmaker, V. Shantaram. Dharmatma is a 1935 devotional biopic made in Marathi and Hindi. The film was based on the life of legendary Marathi religious scholar, Sant Eknath, who authored a variation of the Bhagavata Purana called Eknathi Bhagvata. The story of Dharmatma revolves around Sant Eknath’s teachings that tackle social injustices such as untouchability and the class system. Dharmatma starred Marathi stage legend and noted singer, Bal Gandharva in the lead role as Sant Eknath. The film has the distinction of being one of the few Indian films that tackled the sensitive subject of caste system and untouchability in the 1930s (most notable among others being Achhut Kanya 1936). V. Shantaram made several mythological films in his career. However, Dharmatma was the only devotional film that he directed, making this old Marathi movie poster, highly collectible. Extremely rare, old Marathi movie poster of the black and white film, Kunku (1937) for sale. This is an actual surviving original old Marathi movie poster of the 1937 film which was produced by Prabhat Film Company and directed by legendary filmmaker, V. Shantaram. Kunku told the story of a young woman (played by lead actress Shanta Apte) who rebels against her marriage to a much older widower, as was the norm in those days. Kunku was a critical and commercial success, and was shown at the Venice International Film Festival. The film was one of the early social awareness themed films in India that tackled the sensitive subject of treatment of women in Indian society. 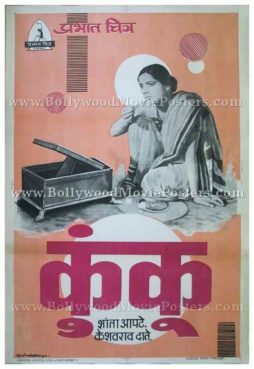 Kunku was also one of first films made in India that openly dealt with the issue of widow remarriage, making this old Marathi movie poster, highly collectible. Kunku is a 1937 Marathi social awareness film based on the novel, Na Patnari Goshta by Narayan Hari Apte, who also wrote film’s screenplay. Lead actress Shanta Apte even sang a few songs in the film, most memorable among them being a full-fledged English song called “A Psalm of Life”, written by Henry Wadsworth Longfellow. Printed and circulated during the first release of the film (early 1940s), this old Marathi movie poster was originally designed for publicity of the film but never ended up being used. 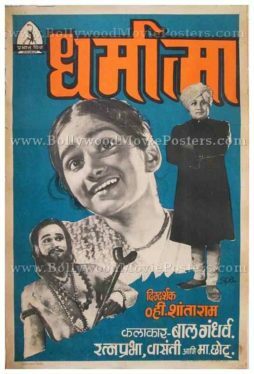 Extremely rare, old Bollywood movie poster of the Hindi film Chandrasena (1935) for sale. This is an actual surviving original vintage Bollywood poster of the 1935 Hindi mythological drama which was produced by Prabhat Film Company and directed by legendary filmmaker, V. Shantaram. Printed and circulated a few years after the original first release of the film (early 1940s), this old Bollywood movie poster was originally designed for publicity of the film but never ended up being used. Chandrasena is widely credited as the first film in India to make use of the trolley and generate special effects such as (flying figures and arrows), making this poster, extremely collectible! This poster has been graded ★ As Is mainly due to stains and discoloration of the paper. The poster is in fair condition overall and has no pieces missing. In this vintage Bollywood poster, two black and white photographic stills from key scenes in the film are seen pasted against an orange background. The story of Chandrasena was based on an episode from the Ramayana. Several remakes of the same were produced subsequently, most notable among them being Homi Wadia’s Chandrasena that released in 1959.